As the focal point of the entire NBA, it makes sense for the Warriors to change. Here, we assess all that's different in Golden State, including the Death Lineup, Andre Iguodala and more. As expected, Durant's arrival in Golden State last season sharpened every edge of his game. No defense could properly account for his size, speed, and shooting as it was—even in the most predictable isolation scenarios. Golden State took that same suite of basketball attributes and honed it against the rhythm of the league's most unstoppable offense. Durant had been more prolific, but never more devastating. That hasn't exactly changed, though the manner in which Durant scores subtly has. Last season, Durant drove headlong to the rim at every opportunity, enjoying the open air of a spread offense after years of playing with questionable shooters. The newest Warrior also seemed eager, at times, to prove that he was capable of exactly the kind of dynamic off-the-dribble attacking that Golden State seemed to lack in the 2016 Finals. Those days are over. The Warriors are champions again and Durant has fully settled in. With that comes one notable change to his shot profile: Durant is rooting more of his offense in the mid-range. Watch Durant in action and you can see his evolving approach: the way his first dribble has become more of an evaluation than an explosion, how he sets up his defender and what shots that allows him to create. Around 7% of Durant's shot attempts have moved from the restricted area to the mid-range, according to NBA.com, and with that his free throw rate has dipped to career-low levels. One might take this as a natural byproduct of Stephen Curry's absences this season. Take Curry out of the lineup, after all, and the scope and direction of Durant's contributions must change. Yet the trend holds both when Durant plays with Curry and without. No matter the circumstances this season, Durant is finding more of his offense at a moderate distance. It works just the same because Durant is an aberration. The same kinds of shots that would feel like a compromise for other players and offenses fly in this case because Durant is converting mid-range shots at a 49% clip. 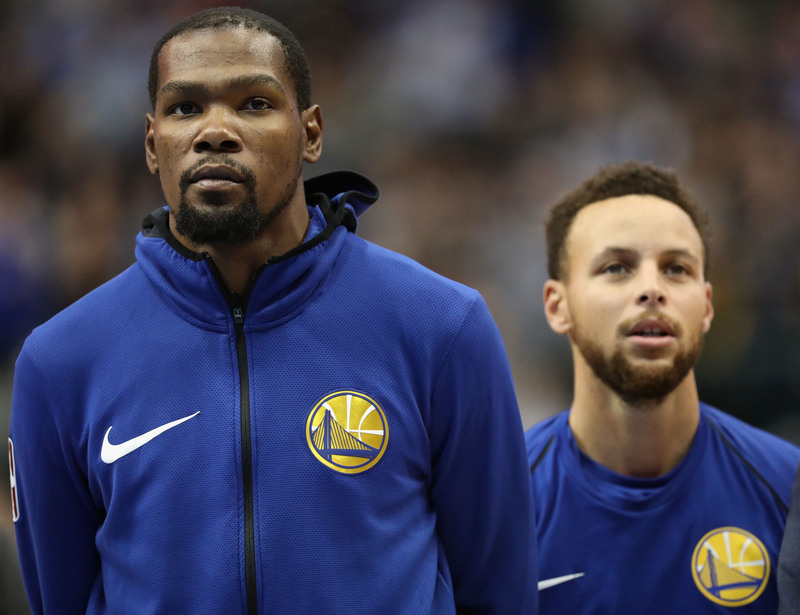 Whatever the cost to his individual efficiency, the Warriors benefit from the diversification and Durant himself better preserves his body for a long season. Weirdly enough, Golden State's best theoretical lineup—of Durant, Curry, Draymond Green, Klay Thompson, and Andre Iguodala—has been a clear net negative this season. Necessary caveats apply. Various injuries have kept that unit to 58 total minutes this season, hardly enough to make any definitive claims. That said, the evidence has been striking enough to take note. Early in the season, we saw the Warriors roll out this lineup in the seeming expectation of a run. The players may have gotten ahead of themselves; this lineup only really goes when everyone is running and cutting and switching and scrambling at full speed. When they commit at that level, this group is still the most ruthless in the league. Anything less and they risk painful mistakes on both sides of the ball. Thus far, this group has played in exactly the style you'd expect but with none of the substance. It might be the clearest casualty of Golden State's relaxed commitment to defense on a possession-to-possession basis. Clearly the Warriors thought enough of Bell to fork up $3 million—more than triple Bell's salary—for the chance to select him at No. 38 overall in the draft, but even that understates his increasing importance to the Warriors. Bell could easily be one of the team's most important contributors by season's end. His presence alone almost makes JaVale McGee redundant; Bell poses a similar vertical threat (though at less extreme dimensions, in McGee's defense) but with only a fraction of the headaches. We've seen Bell start for Green in a pinch and play minutes at center in high-leverage situations. Results have been mixed. Opponents will continue to test Bell as a roller and cutter, challenging him to find ways to contribute when he can't immediately catch and finish. Sometimes Bell makes smart reads out of those situations, throwing just the sorts of passes that Green would. In other cases, he halts the flow of the offense entirely by freezing up when he needs to make a move. The reps are what matter most at this point. Bell will see time in the playoffs out of matchup necessity. Zaza Pachulia and David West aren't cut out for every opponent and every series, leaving Bell as one of the most appealing options on the board. Some plus-minus magic is well within his reach. While it wasn't quite a Westbrook-level effect, last season's Warriors—an all-time titan of a team—essentially played their minutes without Curry to a wash. They've been much more successful since. 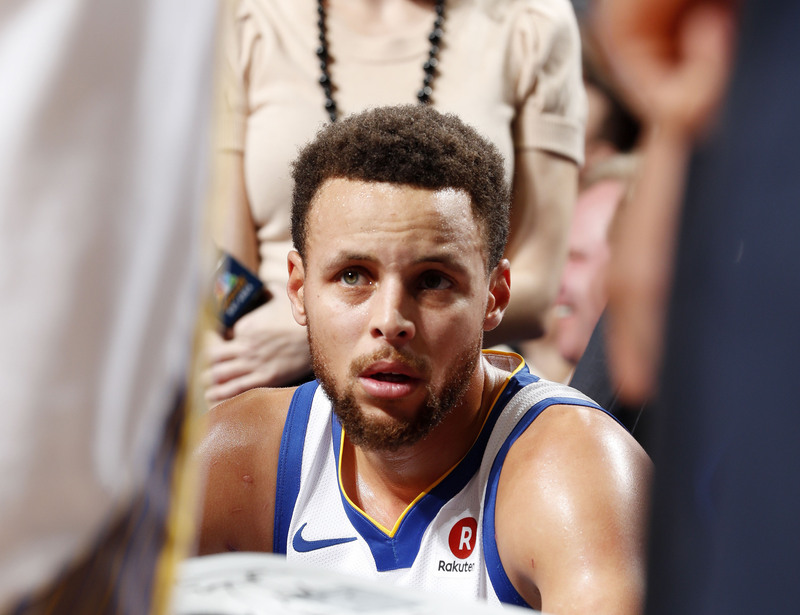 The Steph-less Warriors are outscoring opponents by six points per 100 possessions, a net rating that would otherwise rank third in the league. It goes without saying that Golden State's style of play changes without Curry. So it goes when the best shooter of all-time exits the stage. But where last year's team plugged in Ian Clark (who played over 1000 minutes last season) as a sort of Curry surrogate, these Warriors have leaned into their weirdness. Patrick McCaw, a second-year defender and slasher with an inconsistent jumper, has stepped in for Curry situationally. Durant has run the offense with Green and/or Iguodala facilitating. Shaun Livingston, who is really more of a natural wing at this stage of his career, nominally plays the point but shares creative responsibilities with ease. Few other teams, if any, could operate this way. In Oakland, it works. The league is wise to Iguodala, who—all things considered—would prefer not to shoot very often. Last season, that served him well. Defenses so readily left Iguodala to guard against other threats that they left the door open for clean looks and a surprisingly efficient campaign. Iguodala was as confident as he's looked in years while shooting 53% from the field and 36% from three. That Iguodala is gone. The current version is again reluctant to even attempt layups. His shooting percentages (42% overall, 23% from three) have cratered. Within the arc, Iguodala is whiffing on long twos—a shot he made at an unsustainable 55% clip last season. Beyond it, Iguodala has been forced into more makeshift offense than is comfortable. Some of that is a situational byproduct. Curry and Green, the creators historically responsible for many of Iguodala's open looks, have both missed enough time to warp Iguodala's production. Still it's strange that Iguodala is attempting fewer corner threes than he has in years, floating out instead toward the top of the floor. The offense is still better with Iguodala than not, as is Golden State overall. If he continues to shoot this poorly, however, the calculus of guarding the Warriors—how overtly opponents can abandon Iguodala and what that means for the playing rotation on the whole—could begin to shift.